Earlier research, such as that carried out by Sir Humphrey Davy and Chevreul, was in colours and pigments. The discovery of photography made available a new tool for the study of Old Master paintings. Some of the earliest photographic experiments of Niepce and Daguerre had been attempts in that direction. Photographers attempted, 1861, the first reconstruction of the Jan van Eyck Mystic Lamb . The triptych's wings were then in Brussels and Berlin while only the central panel remained in Ghent. The German physicist Rontgen who discovered X-radiation in 1895, quickly brought it into the service of the fine arts. His is the earliest known reference to the possible use of X-radiation in painting. In 1896 he discussed the absorption of the radiation by the lead white pigments contained in paintings. A year later, scientists X-rayed a painting by Albrecht D�rer and published a paper which proposed this method for the examination of works of art. From then onwards this type of research advanced in Germany and in France (under Ledoux-Lebart), and in Switzerland from the beginning of the First World War. Hardback - 148 pages, format 27 x 22 cms (10 1/2 x 8 1/2 inches) Irish Academic Press, ISBN English 0-7165-2531-3. North American Distribution; International Specialized Book Services, Portland, Oregon. 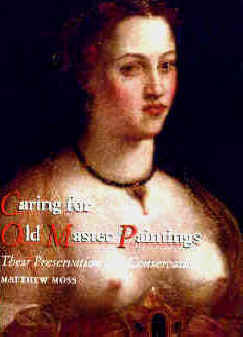 Buy "Caring for Old Masters Paintings"